In my opinion, there’s no sense in re-inventing the wheel if Apple has already done the job for you. Over the coming months you’ll find there are an amazing number of undocumented wheels within the Apple libraries that let you get on with writing great applications without having to reinvent what Apple have already done. They are just waiting for you to set ’em spinning! At this point, a few folks will doubtless be sharpening their quill pens (or even wooden stakes!) and preparing to chastise me for using undocumented features. After all, it’s possible that the techniques I’m going to describe may not work in some future version of the operating system, right? That’s true, but I’d offer a couple of counter arguments in return. First, Leopard (OS X 10.5) has only recently been released, and is likely to be good for several years — it’s very unlikely that minor system updates would impact what I’m describing here. And if they do, I’ll obviously make every effort to bring you a workaround. Next, and more importantly, you can spend more time making your great Mac application even greater — and surely that’s what we’d all like to see, including Apple. Right, Apple? Let’s start by taking a look at preference dialogs. As you’ll know, the standard way of building a preference dialog is to create a window complete with toolbar buttons for each “page” of preferences. 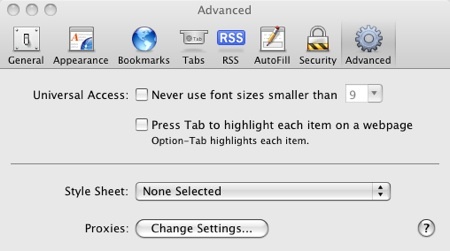 You can see an example of this in the advanced portion of the Safari preferences dialog box (below). In recent years, the mechanics of automatically saving and loading your application preferences have become easier, largely due to the introduction of Cocoa bindings. You can read more on this here. What I’m concerned with in this article, however, is the user interface rather than persistence issues. There are really two undocumented classes we need to focus on here. These are NSPreferences and NSPreferencesModule. You can think of the former as a sort of supervisory class that handles the display of the preferences window. Most of the real work is done by this class, but — for our purposes — the interface is extremely simple. You will typically have one subclass of NSPreferences, and it will be instantiated by AppKit, not by you. The other class, NSPreferencesModule, corresponds to one page of your tabbed preferences dialog. If you’ve got three preference categories (for example), then you’ll need three subclasses of NSPreferencesModule. Again, you don’t need to instantiate them.